During my stay in Brussels I found time to stop by the A.M. Sweet Tea Room, which is conveniently located near the old city centre. A.M. Sweet Teahouse serves a wide range of loose tea, all sourced from the Mariage Frères tea company. Their tea menu includes several Japanese green teas, an extensive range of flavoured green teas, a number of pure black teas, flavoured black teas, several rooibos, a few oolongs, and a white tea. Among their green teas, I spotted one with which I was not familiar: Fuji-yama. This Japanese green tea is grown near Mount Fuji, and, according to the menu’s description, is defined by its “fine leaves, grand aroma, and subtle taste.” As a green tea fan who is always curious to try new varieties, I opted for Fuji-yama. 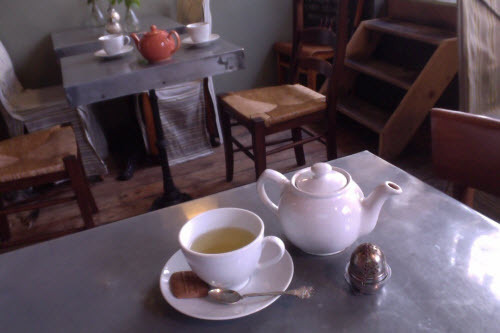 My tea came served in a teapot with a loose leaf infuser, along with a complimentary, typically Belgian, biscuit. As you might expect, Fuji-yama had the distinctive grassy, slightly sweet taste that is characteristic of Japanese green teas. However, although it was not quite as grassy and sweet as a Gyokuro, it was slightly richer and more full-flavoured than a sencha. On top of a tasty tea, the cosy interior and the very lovely, welcoming owner made my experience at the A.M. Sweet Tea Room an extremely pleasant one. And in case you need anything to accompany your tea, they also offers a delicious range of baked goods and sweet treats (both to eat whilst you are there, or packaged up to enjoy later or give to someone as a gift)—including, of course, some bona fide Belgian chocolates!